Assemble a group of heroes and begin your journey from Sara Forest to the High Heaven in a quest to defeat the forces of darkness! Idle of Heroes comes with 200 characters that have all types of skills, challenging quests or raids that can help you increase your level. Besides that, you are also able to enjoy various features that will make your game much more interesting. The visual design is of high quality and the graphics really make you part of the story. The artists at DH games were very attentive to detail so they’ve created amazing characters that make the atmosphere more genuine. What makes this game interesting is the fact that, as the name says it, actions take place while you are away from your phone. This means that your heroes will train even though the game is idle. 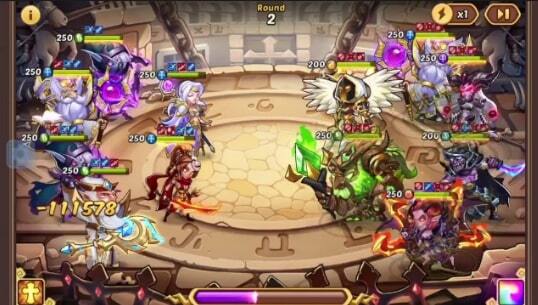 By the time you open the game again, they will be stronger with new abilities waiting to be tested in battle. The game has many helping features that can lead to winning great items but one of the most exciting is the Wishing Fountain. If you are familiar with casino games, this will seem a piece of cake to you. Make the reel spin by using the Wishing Coins or the Casino Chips. For every chip you earn, you will receive 1 spin. Like any other casino game, this can offer you some rewards such as Gold, Magic Dust, Spirit and Monster Souls. The number of prizes varies according to the level you are at. You can start using the casino feature from level 14. But surprises do not end here because if you manage to reach the VIP status or above level 80, you can spin the reel 10 times with just 8 chips and your benefits increase. Do your best to become a VIP 3 or reach the level 80 to take advantage of the Super Casino feature that comes with even bigger surprises. You can play this game on any of the new casinos listed here. 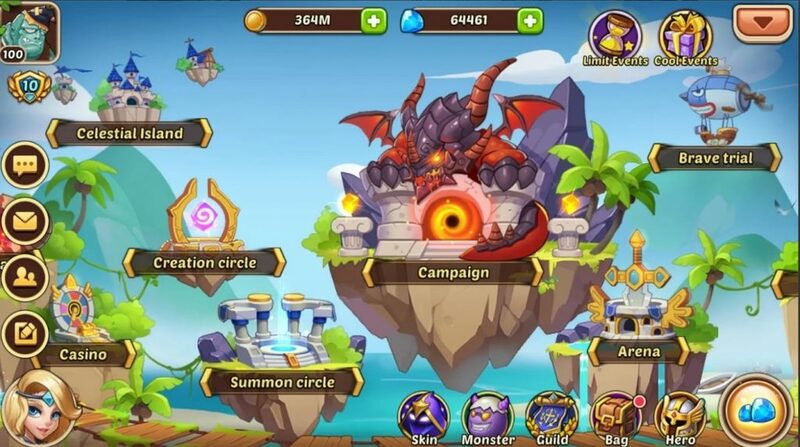 Even though Idle Heroes has an intuitive gameplay and features a tutorial that can help you familiarize with the important characteristics, is it more than meets the eye. You will discover that there are available all kinds of battlegrounds, quests, arenas and other guild events that will allow you to prove what you are made of. These come with many rewards such as gold coins, which you are able to use to purchase items to upgrade your hero. Create your own guild along your friends or other people on the server and you can participate in guild wars. Fight alongside your people or join the multiplayer battles to lead your guild to glory! Put your skilful heroes to fight in the Worldwide Arena and if your hero climbs the leader board, you can enjoy some amazing rewards. Your main purpose is to defeat the forces of darkness but in order to reach that rank, you have to create a team with the best heroes. With over 200 characters at your disposal that come from various factions, you will surely have a lot to pick from. Use the Prophet Tree feature to summon your heroes and train them to become more powerful. The battlegrounds are perfect for your characters to acquire some skill so make sure you participate. You can also make them evolve by converting them into spirit material. Use the Blacksmith feature to forge powerful weapons which represent an important helping item. If you like strategic games filled with various items that can make your gaming hours more interesting, Idle of Heroes is perfect for you. What is great is the fact that you can make progress even though you are not on your phone because the idle system allows your heroes to keep training. It is fun, easy to understand, and has an impressive design that will surely mesmerize you. Idle of Heroes APK is ready to download! 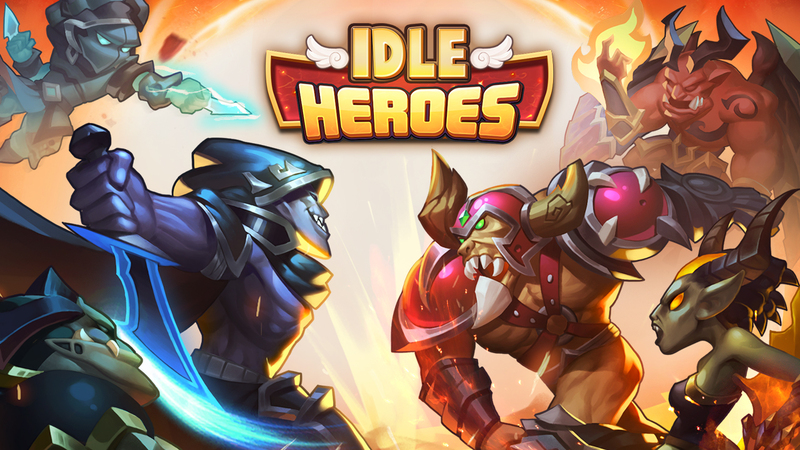 Depending on your needs, you can download Idle of Heroes MOD APK or Idle of Heroes Original APK. Or install from Google Play / App Store if you want.